I recently returned from the IECA tour of Arizona colleges and universities and had a chance to dig into the academics and environment of several choices popular with Seattle students. Touring colleges with a group of experienced counselors means that in addition to hearing from the admissions office, knowledge is compounded with anecdotes from counselors whose students have matriculated. This insight is what makes touring colleges with professionals so great. Following the tours, the conference kicked off in Scottsdale, and I have highlighted information from a key session in another post. As a leader for the tours on the first day, I had the fun job of working directly with the admissions representatives to help make the day run smoothly for the counselors and our hospitable hosts. Our first stop was the University of Northern Arizona, located in Flagstaff, an outdoorsy town high in the mountains and pine trees at about elevation 7,000. The town has fun restaurants and activities, and residents welcome students with open arms. Flagstaff is a “Dark Sky”, with several observatories located nearby and light pollution minimal, allowing for beautiful night skies. Flagstaff is a place with both sun and snow, nearby mountains, the Grand Canyon and unlimited outdoor activities all within reach. With just 18,599 undergraduates, and few graduate students, academic life is focused on the undergraduate. At NAU, living/learning communities are available for those taking similar courses and sharing interests. With seven separate colleges, students can select from a variety of majors. A top program lives at the College of Education, with students starting freshman year in classrooms. One student shared her story of initially being interested in teaching, and then discovering early freshmen year that this wasn’t a good fit for her, then switching to another area of interest. This is another example of why internships and early exploration in the field can help students find what they don’t like as much as what they do, both valuable lessons early in a student’s career. NAU is part of the Western Undergraduate Exchange (WUE) and all students applying within the deadline and accepted will be offered this scholarship, which is 1.5 times in-state tuition. Families can explore this scholarship and others here. In addition, housing and food costs are relatively low in Flagstaff and the cost of attendance with scholarships can be very reasonable. Then it was off to Embry Riddle, a university focused on all things aeronautical, with additional majors in the areas of global security, space physics and intelligence. Last November, we toured Embry-Riddle’s campus in Daytona, Florida, providing a good comparison of programs. While the student body is not as large in Arizona, different programs are offered here, and each campus has students from all 50 states and abroad. Our program began with lunch and a presentation by the chancellor, who lives on campus and engages with students at a high level. Faculty engagement is key here, with a large parent organization helping connect families and ensuring student success. Learning at Embry-Riddle is very hands-on, students are collaborative, and teamwork is key. The goal is to continue to expand the student body, with the number of graduates increasing 25% already from 2006 to 2265 undergraduates. Forty-two percent of students study engineering, and one third of students attend flight school on campus, and graduates may teach their fifth year and gain their hours for a commercial rating. The faculty at Embry-Riddle has spent an average of twenty years in the field before teaching, with over 80% coming from outside academia. Students benefit from their direct industry, agency and field experience. 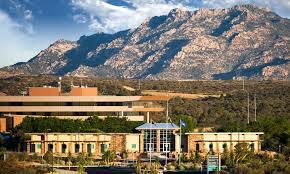 Our last stop of the day was Prescott College in Prescott, Arizona. At this small, liberal arts college, interdisciplinary learning is both self-directed and experiential. During the first twenty days, student back pack in the Grand Canyon and bond with faculty and students. Prescott was founded during the 1960’s environmental movement, and students are encouraged to make connections and find their passion. Freshmen are required to live on campus in their living-learning communities and the residence halls are designed to encourage a sense of community. Small classes are the norm at Prescott, with ten to twelve students. Students don’t receive grades unless they request them. The next day started with a visit to the University of Arizona in Tucson. The University of Arizona admissions staff prides itself in connecting with applicants through their call center, guaranteeing that a student will answer at admissions to help answer questions. The main campus is surprisingly contained in just one square mile, with a distinctive campus feel and all activities centered on campus. The campus is bicycle-friendly and students were heading to class on foot as well, enjoying the sunny weather and playing Frisbee on the lawns. The University of Arizona is a land-grant university, with a veterinary school opening next year. Top programs in anthropology, fashion merchandising and astronomy are just of few of the majors offered at this university of 33,000 undergraduates. While the student body is large, all freshmen math classes are capped at 35, encouraging engagement and success. The University of Arizona is test-optional, with the exception of admissions to the Honors College or engineering, and if students want to be eligible for scholarships. Students applying to the University of Arizona are not required to write an essay, but the admissions office explained that this can help them understand more about a student through the process. The Honors College students are fully integrated into campus, with average class sizes of 25 and a focus on critical thinking. The University of Arizona is the only university in the country to offer an undergraduate law major with direct transition to law school. The dance program is one of the top five in the country, and is the most competitive major to get into with auditions required. 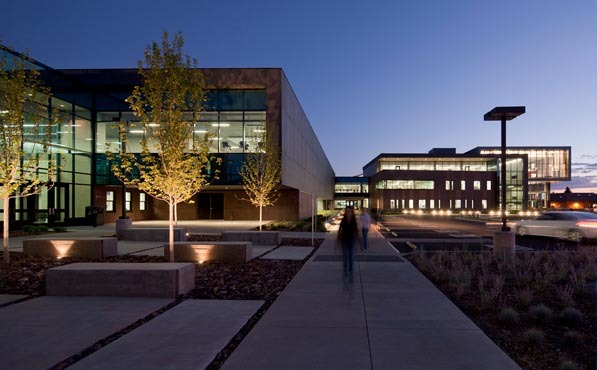 Architecture is a five-year program, resulting in a license to practice. Engineering majors abound with 13 majors including aerospace. Research can begin in any major freshmen year if students choose to take advantage of this. An interesting offering on their website is a matching of a student’s personality type with degree, an innovative approach to helping students connect at a deeper level with programs at which they will thrive. The SALT Program at the University of Arizona is known nationwide as one of the best programs in the country for students with learning disabilities. Dr. Rudy Molina, the Director of the SALT Program, spoke to us about his personal experience with his own learning disability and his passion for the program at the University of Arizona. The program is staffed with thirty professionals and 600 students a year participate. Students admitted to the program make a two-semester commitment. Twelve learning specialists meet with fifty students each, and make it their goal to understand each student’s needs, track them, develop learning strategies for success, and support self-advocacy. Students learn how to talk about their needs and develop strategies for time management while in the program. Students apply first to the University of Arizona and then to the SALT program separately, providing documentation of their learning disability. Students are encouraged to apply early in the process in the fall, and I always recommend visiting the SALT Program during a tour of campus. While students pay an additional fee per semester for the program, there is a growing endowment for scholarships and it can make the difference in a student’s success in college. We heard from a student in the program who initially was undecided in his major and felt incapable of learning math, who is now an electrical engineering major succeeding in an area that previously would have been unimaginable to him. The SALT Program is expanding their current building. If students are experiencing social issues, psychology interns provide support in addition to campus counseling. One on one and small group tutoring can help students succeed as tutors have knowledge of specific courses, encouraging skill development for the process of learning, not just the answer. No scores are required for scholarships to SALT, but a commitment to success and the program are evaluated. Submitting the optional essay is very helpful for students with learning disabilities and students are encouraged to explain their issues. The program has an 81.2 % retention rate. 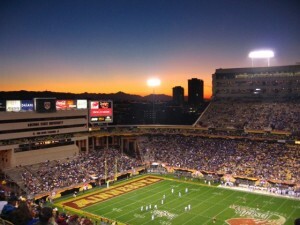 Study abroad is popular and students can participate in the National Student Exchange and study one semester at University of Arizona rates. 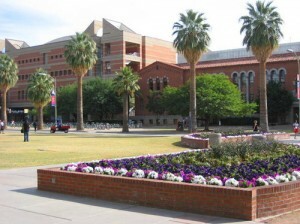 ASU is the largest public university in the United States, with 300 degree programs and 40% of students from out of state. We participated in an interesting demonstration of their unique E-advisor system which tracks student progress and helps identify students who are struggling. Students are audited three times per semester and must meet with an advisor if they are off track. If students remain off track for two semesters with their major courses and graduation requirements, they are asked to move on and transition to another major. ASU has four campuses, and specific majors are housed a different majors, so students are encouraged to research these options before applying. The WUE program includes majors at the nearby Polytechnic Campus. Students interested in WUE must participate in programs at the downtown Phoenix, Polytechnic and West Campuses, and are not available at the main Tempe campus. All campuses include housing and encourage a sense of community. All freshmen must live on a campus based on their major or college, and even if a student is undecided, they need to specify a general interest for housing purposes. The only portfolio admit is art, and all other majors are open. An interesting search tool with occupational salaries, and careers in different majors is available online. The Me3 app is a unique tool developed by ASU to help students drill down to majors that might be a good fit for a particular student’s skills and interests. Tutoring is free to all freshmen. Applications for admission open in July and take thirty minutes or less to complete. Merit aid is available out of state for specific GPA and test scores, and can be re-evaluated with additional higher test scores received after admissions. For more competitive programs, ASU has higher admissions requirements and students can perform a degree search to learn more. The Barrett Honors College program is offered on all campuses and reaches 6000 students. The website offers more detail but the average scores for admissions are a 1300 SAT (critical reading and math only), a 29 ACT and an unweighted 3.8 GPA. The application review is holistic and students must submit two recommendations, an essay and a list of activities. Admission is on a more traditional deadline, not the general ASU rolling process. ASU Barrett offers lots of different ways to get honors courses, and students must complete 36 credits, a thesis or project, an internship, research and study abroad. Honors students can choose housing at the Barrett Apartments and the students we heard from enjoy both engagement in overall campus activities and connections with their fellow Barrett students in their housing and/or courses. Students can also apply to Barrett after their first or second year at ASU.